. Closed Tags: Barbara Haig, Cadogan Enright. 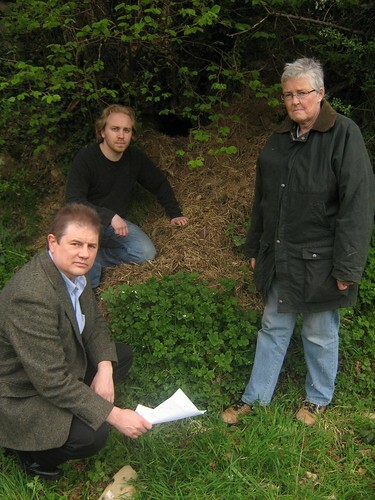 Photograph shows (l to r) Down Councillor Enright with Green EU candidate Stephen Agnew being shown a 200 year old Badger sett by by local wildlife campaigner Barbara Haig which is threatened by the cull. DOWN Cllr Cadogan Enright has thanked UUP MLA John McCallister for putting questions to the Stormont Assembly on behalf of local Wildlife campaigners regarding the proposed Badger Cull in Co. Down. Badgers have been blamed for the spread of T.B yet many local wildlife campaigners have strongly opposed such an allegation. Councillor Cadogan Enright and UUP MLA John McCallister have been working together along with local wildlife campaigners in support of their campaign against the proposed badger cull in our area. UUP MLA John McCallister said, “Previous culls in Britain and the Republic of Ireland have done nothing to reduce the instances of TB and in fact TB instances have increased in these countries. However in Northern Ireland where there has been no cull we have seen the instances of TB falling each year. “I will be putting questions to the NI Minister Michelle Gildernew on the lack of scientific evidence and the waste of financial resources in these difficult times. Cllr Cadogan Enright concluded, “It is good to see prominent members of the farming community taking a lead on these sorts of issues and I applaud Cllr Robert Burgess and John McCallister MLA”.